… so since a flurry of remix activity I’ve take a break to do grown up man things like paint the kitchen. Thank the lord for Ipods. Quite liked the White Lies single, tho’ I was less than blown away by their last album…. shocking lyrics, but this single’s alrite…. only alrite as I’m old enough to remember the Teardrop Explodes. it was amazing. As Im 37 ……. More hot off the press albums of the month…. from: 1990!!! In the NME, March they rounded up the ten albums you should own. Great month: Blue Aeroplanes, Lloyd Cole and Furniture all feature. Hard to imagine that I’d find three albums in single month I’d like let alone love , now! 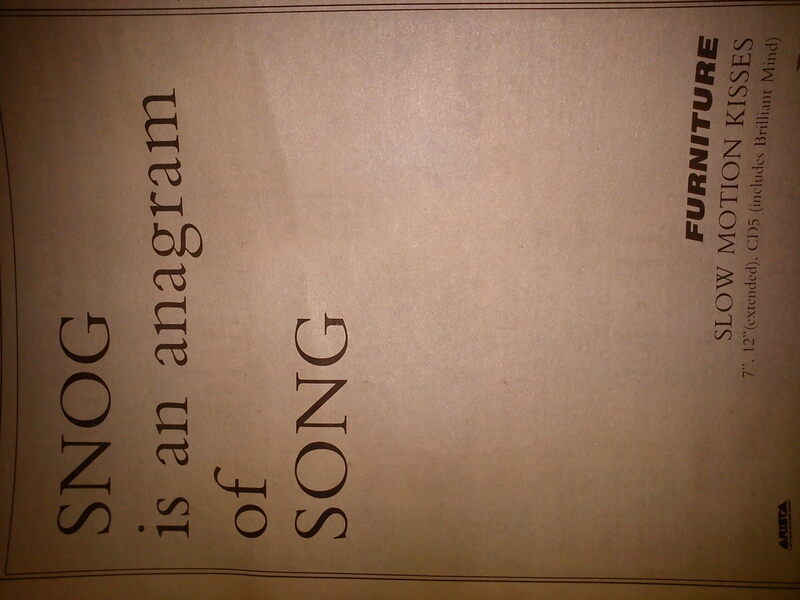 Found this advert for the Furniture single. Really great art.